1. What if I want my child to attend your program, but my child doesn’t want to? Our program is 100% voluntary. Our treatment can only be successful when clients have at least a minimal investment in working on some aspect on their mental health. If your child is resistant, we encourage you to schedule a walkthrough appointment. This will allow you and your child to tour the facility, have your questions answered by a member of our staff, and determine if our program is a good fit for your child’s needs. 2. Can my child start in the 3-hour program instead of the 6-hour program? Typically, no. 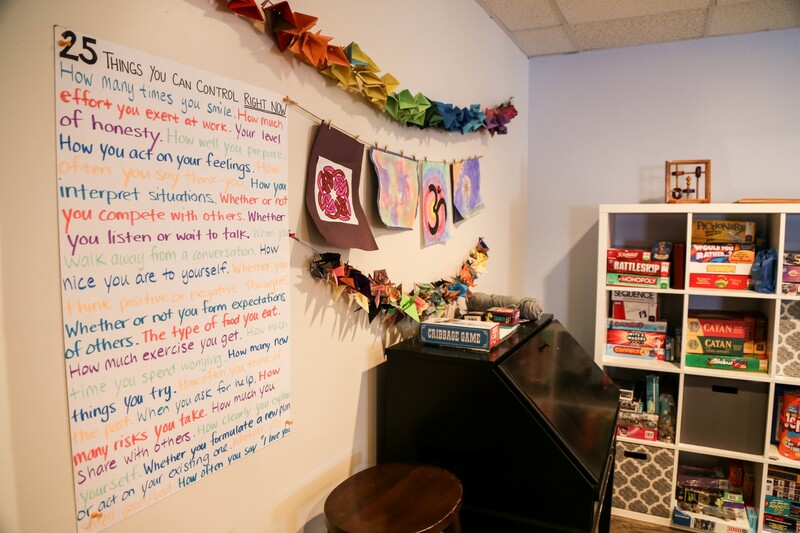 Our program is most effective when clients attend at least one full week of PHP, which gives them access to both the didactic group and group therapy. We use the 3-hour IOP primarily as an internal step-down to help our clients transition towards discharge. In rare cases, we start clients in the IOP, but only if our clinicians determine at intake that IOP is the appropriate level of care. 3. How long will my child be in your program? Average length of stay is 10 days for PHP and 15 days for IOP, but this can vary considerably based on your child’s needs. Clients must meet medical necessity for our program, and most insurance plans require prior authorization for PHP and IOP treatment, which we handle. We provide parents/guardians with as much advance notice as possible regarding length of stay, step-down to IOP, and discharge dates. However, please be aware that we often only know a few days in advance, due to the nature of insurance authorizations for this level of care. 4. 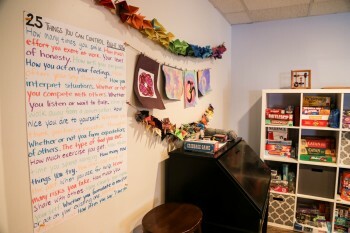 Will my child receive individual therapy in your program? No. Because we are a short-term stabilization program, it is not beneficial for your child to become overly attached to any one staff member. If your child does not already have an outpatient individual therapist, we strongly encourage you to find one, and we are happy to provide referrals. It is very helpful to have this in place before your child discharges from our program, to ensure a smooth transition and provide for continuing care. 5. How can I be involved in my child's treatment? We welcome your involvement! Please consider attending parents’ group, which is held every Monday from 5:15–6pm. It is a drop-in group with no appointment required, and you are welcome to come even after your child has discharged from the program. You may also set up a family meeting through Dave at the front desk. Family meetings are held from 5:15–6pm most days each week. It is best to wait until your child has attended at least one full week of treatment before having a family meeting, to give our staff time to get to know them and to develop a treatment plan. 6. How will I be updated about my child's progress? Within your child’s first few days of treatment at Endurance, a clinician will meet with you briefly to go over your child’s safety plan and treatment plan. You will be asked to review and sign off on both documents, and you will be given copies to bring home. We will also reach out to schedule a discharge meeting, at which time we will review your child’s discharge summary, safety plan, and future treatment goals. If we have safety concerns at any time during your child’s treatment, a staff member will reach out to you immediately and, if necessary, refer you for a crisis evaluation. 7. What is the best way to communicate with Endurance clinicians? For urgent concerns, please call the front desk. For less urgent matters, email is preferred. Staff email addresses are available on business cards at the front desk and in our waiting room. 8. Can Danielle Bouchard be my child's ongoing psychiatric prescriber? No. Danielle can prescribe for your child while he or she is in our program, but she is not available to prescribe on an outpatient basis after your child has discharged. If your child does not currently have an outpatient psychiatric prescriber, we encourage you to start looking for one as soon as possible, and we can assist you with referrals. Be aware that it can often take several months to get an intake with a new psychiatric prescriber. 9. Why does the group therapy schedule include some “unstructured” time? During the time between our structured groups, your child will participate in our therapeutic milieu and receive in vivo coaching from our staff. This will help them practice the skills to develop and maintain healthy interpersonal relationships, and learn to manage common stressors in new ways. Please see the page “Our Program” for details about our treatment model and program structure. 10. I’m concerned that my child may be influenced negatively by other children in the group. What is Endurance’s stance on this issue? Although this is of course possible, we feel certain that few things occur at Endurance that are new to any given member, or that they are not likely to experience in any number of settings outside the program. One truly new experience we can assure all members is the powerfully pro-social environment in which things occur, and the powerful, non-violent pressures that encourage practice of more healthy habits. 11. What if my child wants to maintain friendships with other clients outside of the program? The overall benefit of friendships developed at Endurance is a matter of individual assessment. Endurance empowers parents to make all decisions regarding their children’s peer group. 12. What does it mean if my child is “restricted” from your program? Everyone at Endurance, both clients and staff, are committed to following our behavioral guidelines, which are available on our website. If your child is restricted, it means that he or she has violated those guidelines in some way. If this happens, an Endurance staff member will meet with you and your child to discuss the specifics of the situation. Once restricted, a client may not return to PHP until having a reintegration meeting with our staff. At that time, it will be determined if your child will be able to continue the program and, if so, what steps he or she must take in order to do so. 13. How does your transportation service work? As we are able, we provide one-way transportation for clients to Endurance, and parents/guardians are responsible for rides home. We pick up clients within a reasonable radius of the office, typically 30 minutes driving time. If you live outside our service area, it may be possible to set up a meeting spot. However, please be aware that we cannot guarantee transportation services for all clients. We do our best to accommodate all clients without subjecting anyone to overly long car rides. If you are interested in setting up transportation, please speak with Dave at the front desk. If you have Well Sense or MassHealth insurance, you may be eligible for free transportation to and from our office through your insurance, and we are happy to help you set this up. 14. What holidays does Endurance observe? Endurance is open all year, during the summer as well as school vacations. 15. What about snow days? We make every effort to remain open during inclement weather, while maintaining the safety of our clients and staff. During winter storms, we will make the determination about remaining open by 10:00am. You will receive a notification by text message or email, and we will change the message on our front desk voicemail accordingly. Please be aware that our transportation service may not be available on days when we open late or close early due to weather.